In the running to-do list in my mind (not the "vacuum car, pick-up dry cleaning, make dentist appointment" list but the larger, vaguer "learn Spanish, adopt healthier eating habits, look into composting" list) one of my items is "expand salad repertoire." My usual salad is plain leaf lettuce dressed with olive oil, sherry vinegar, salt and pepper. And while I love my usual salad, I'm in a little bit of a rut with it. The only other salad I make, and not too frequently, is this one. I began making it because I was looking for a way to use the delicious smoked trout I'm able to buy at our farmer's market. Smoked trout is rich and almost sweet which makes a nice contrast here with the slight bitterness of the radicchio and the sweet-tartness of the grapefruit. Because of the richness of the smoked fish it's a satisfying salad and with larger portions can easily be a meal. It's also pretty, with color that brightens up a winter day. The recipe is from Daniel Boulud's first book Cooking with Daniel by way of the Best American Recipes of 1999. You can find a video of Boulud making this on the Food and Wine website. 3. Peel the grapefruit, and then peel the membranes off the individual sections. Do this over a bowl so you can catch the juice also. Set aside six sections for garnish and cut the remaining slices into small (approximately 1/2”) pieces. 4. Whisk together the cream and vinegar and season with salt and pepper. 5. Tear the radicchio leaves into bite-sized pieces. Toss with enough dressing to moisten well. Add the smoked trout, walnuts, chopped cilantro, scallions, grapefruit pieces, and croutons. Add salt and pepper, then toss well, adding more dressing if needed. Taste and adjust seasoning. 6. Garnish with reserved cilantro and reserved grapefruit. Serve with additional dressing on the side. 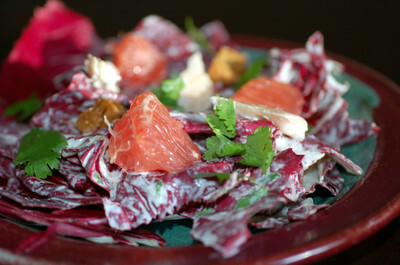 Note: Daniel Boloud suggests reserving 12 of the largest radicchio leaves and serve the salad in those, two to a person. In the meantime, I'm looking for more salad recipes, an activity which mainly consists of mindlessly googling phrases like "best salad recipe." If you have any great salad recipes, please point me in their direction. Wow -- I can't honestly imagine all of these tastes working together, so I will have to try this salad! Thanks for sharing the recipe. That sounds fantastic! I love smoked trout! Not a real salad, but I always like Waldorf Salad with raisins, nuts and apples. I've recently discovered your blog and I'm definitely here to stay! Incredible flavors! I honestly couldn't imagine what this would taste like, but I would love to try it. Mmm. Smoked fish (and trout especially) is a serious weakness of mine. This sounds like a very original flavor combo- Boulud is very good at those, and it is awfully pretty, too. Check it out : little bouffe (see above) has got a lovely salad on her front page at the moment, too. Any salad recipe that calls for cream goes under "Best Salad Ever" in my book. This looks and sounds delish. Now all I gotta do is find some yummy smoked trout. Miz S... you eat with that mouth? That's one of the prettiest salads I've ever seen! You always have such beautiful food. This would delight the eye as much as the palate, I bet. I love smoked fish! But the grapefruit we get is sooo mouth-puckering tart I'm not sure I can imagine it in a salad...or anything much, for that matter. We use to get such nice ones when we lived in the U.S. - and Andorra.. Though I've had cranberries with smoked trout, I had never thought to pair it with grapefruit. I think Jeff would love this flavor combination. Thanks so much for the unique and wonderfully colorful salad! Oh my, this sounds like Heaven! I love smoked trout and salads! We actually try to have a salad once a week and it's been a really great way to try new recipes (so there isn't boredom) and find some incredible (and hearty!) salads that have quickly become favorites! Both of your running lists (the dry cleaning sort, the salad rut sort) sound an awful lot like mine. This looks like a great salad. This sounds great and comes from one of the great chefs of the world. But leaf lettuce olive oil and sherry is one of my favorite salads as well. Lydia, it’s not a flavor combination that I’d ever have come up with on my own. But it works very well together. Ann, I love smoked trout too, and it’s a wonderful addition in salads. Fairfax, I used to work with a woman who made what she called waldorf salad for every office party. It was made with lime jello, cool whip, and miniature marshmallows. Embarrassing confession: I really liked it. littlebouffe, you need to trust Daniel Boulud on this one. Lindy, I agree – Daniel Boulud comes up with some very inventive stuff. Anne, I’d never used cream in a salad dressing before making this but have since and it’s (not surprisingly) very good. Miz S, only if we’re using it to emphasize how delicious something is. aria, thanks! It is sort of visually arresting, isn’t it? Sher, the prettiness of this salad is part of what drew me to it. And it’s just the sort of color you need in winter. Katie, I’m making a note of that: grapefruit in France, not so good. Of course, everything else seems wonderful so that hardly tips the balance. Susan, you’ve got me thinking about dried cranberries paired with smoked trout. lydia saucepan, thank you! I agree with you about the prettiness of the salad and it’s one of the things that makes me like it so much. Michelle, what a good idea! I should start doing a weekly salad too. Meg, I try to keep my lists in my head because I am always and forever losing lists the moment I put them to paper. I notice that some items – vacuum car, for instance – never seem to move off the list. It takes me forever to get around to doing it and almost as soon as it’s done it needs to be done again. Janelle, there is a funny randomness to lists. They’re also revealing although I sometimes worry about what mine might say about me. Adele, a deficit that is so easily corrected and so worthwhile! Harry, Daniel Boulud is interesting to me because despite being one of the great chefs, his books are a wonderful source of inspiration for a home cook and that’s not always true of chefs. did i ever tell you about my roasted grape/pancetta/fried caper with parmigiano crisp salad??? cause it's really good. over arugula. The flavors here sound magnificent. I'm a huge fan of pink grapefuit and love to see it put into salads! The colors just pop! Claudia, I've had my eye on that salad and even went so far as to buy grapes the other day. white on rice couple, thanks! I'm a fan of grapefruit too and particularly appreciate it at this time of year. Good stuff! I am searching for new trout recipes! I am gonna change this up a tad by not using smoked trout, do a pan roast instead. Icks-nay the cream sherry vinaigrette (how Daniel loves his cream) and just make a sherry vin, and grill the radicchio. You may be asking, "Why the hell even bother?" Planning menus for a client who doesn't do: smoked, cream, fat, carbs, and prefers radicchio cooked. Okay, I'll stop talking now. I added your blog to my favorites list. Been looking for recipes that include grape fruit! Thanks and cool pictures. This looks so tantalising. I've only just discovered your blog, but am looking forward to browsing through more of your recipes for ideas and new meals to cook. I have to say that food looks awesome. I would definitely like to try it. its ok , good like. So much useful content here, kitchenography.typepad.com bookmarked !